If you are looking to create some luxury style for your Kia vehicle, Wheel Creations PVD has the perfect solution. From us, you can get great looking chrome rims for your Kia ride that will give your vehicle a unique appearance. Swapping out the stock rims for OEM PVD chrome options is a popular way to modify a vehicle. 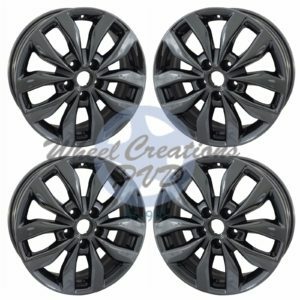 However, with Wheel Creations, you can get sleek looking black chrome pieces that give vehicles an undeniable modern look. Don’t settle for standard chrome rims when you want to upgrade your Kia. Instead, get durable, premium PVD chrome coated wheels from Wheel Creations PVD. We can add a custom black chrome finish to just about any wheels that you want. With our pioneer experience with PVD chrome process, you’ll be able to get Kia chrome rims that look great no matter how many miles you put on your wheels. Our premium wheels are the perfect solution for your vehicle thanks to the specialized powder coated primer and vacuum chamber used to create our signature black chrome rims. Each rim is placed in the chamber before the chrome is electrostatically sputtered onto the rims, creating a phenomenally smooth finish. Because our process is 100% environmentally safe, it is a popular option for vehicle owners of all kinds. We can give your Kia the chrome wheels you’ve been looking for to create an understated, luxurious feel. We even offer different color options – such as PVD Black Chrome, PVD Onyx Chrome, and PVD Midnight Chrome – so you can find the best choice to match your vehicle. These are some of the wheels we currently have in stock. While we sell wheels outright to dealerships, body shops, and direct consumers, we will coat your wheels as well. If you don’t see your car’s model listed above, we can still work with you to get the perfect PVD chrome wheel for your Kia. Chrome rims from Wheel Creations stand out for more reasons than just their look. We also make it a priority to create the most reliable chrome rims for Kia vehicles on the market. To make sure you have the ultimate PVD rim solution, we’ve focused our manufacturing process on giving you wheels that are tougher – so they stay great looking for longer. These rims will stand up to a variety of conditions such as moderate curb rash, road chemicals, harsh weather, and more. While traditional chrome plated wheels peel and corrode over time due to neglect and wear, our chrome rims will keep looking great. So you’ll be able to enjoy them for a long time. In the event that your chrome rims do suffer damage, we offer repair services as well. At Wheel Creations, we’re committed to offering the best in chrome wheel restoration, finishing, and repair services to our valuable customers. We can comfortably handle any wheel specifications and solve your wheel restoration problems with the utmost professionalism. We offer repair services for models such as the Kia Optima, the Kia Soul, Kia Cadenza, Kia Sorento, Kia Sedona, and the Kia K900. Don’t put off giving your Kia the chrome wheels you want any longer. Our unique chrome process is reliable and affordable. With Wheel Creations, you’ll end up with sleek rims you’ll be eager to show off. Find out more about our chrome wheels and manufacturing process by reaching out today. Our team of experts is ready to handle your questions over the phone at (562) 381-2670 or via email at sales@wheelcreationspvd.com.